The registration is possible until 1. July 2019. The participation is confirmed only with the complete receipt of the payment. The competition will be held with a minimum number of participants of 5 athletes. If there are less than 5 athletes on the participant list, the organizing committee reserves the right to cancel the competition. The key date is 1. May 2019. If an athlete can't participate because of a medical condition or accident, the athlete has to provide a doctor's report. If the cancellation is announced until 12. June 2019, 50% of the already paid entry fee will be refunded. After this deadline no refund is possible anymore. 5% early bird discount: Anyone who registers before 1st March 2019 and makes the advanced payment will benefit from a 5% discount. 5% repeat discount*: Every athlete who has already participated in a swissultra race in 2018 will receive a 5% discount on the entry fee for 2019. If you make the advance payment by 1 March 2019 will also benefit from the early bird discount and even save 10%. The swissultra is a non-profit association. The races are self-sustaining and based completely on voluntary work. The entry fees help the organizing committee to maintain a high quality and "all inclusive" service. To participate in the swissultra, an athlete must have finished an Ironman or Ultratriathlon competition or another comparable competition in 2018 or 2019. If you are not sure if you are qualified for this race, please contact us by e-mail at info@swissultra.ch and tell us more about your sports career. The participant has to sign and hand in a disclaimer (waiver) as well as a medical certificate before the start of the race. All documents are available as downloads in the list below. 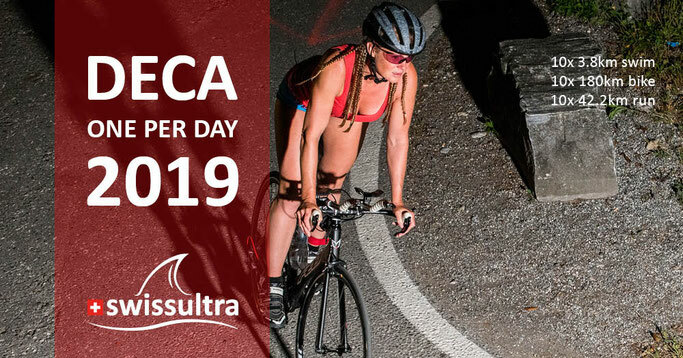 swissultra is part of the IUTA World Cup 2019 and accepts the official IUTA rules. Please click here to read and download. Fairplay is very important to us. Please pay attention to the rules and regulations of the swissultra 2019. The organizing committee is anticipating a fair race without any injuries.